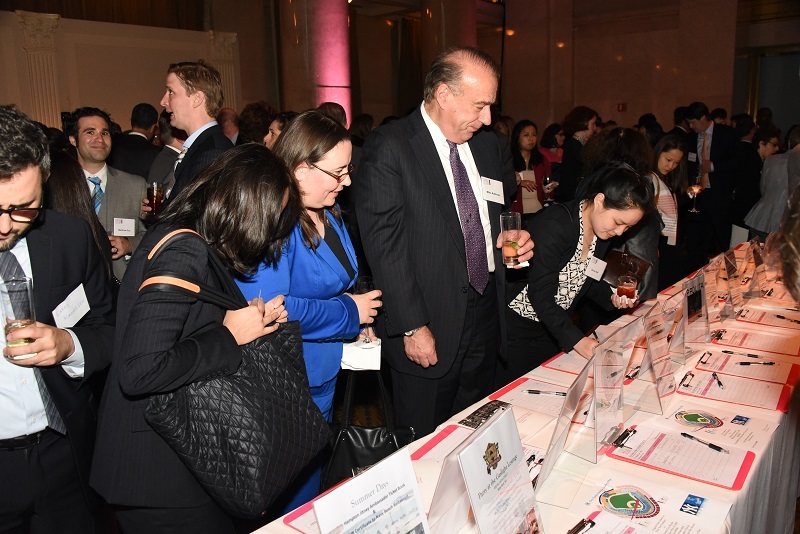 JALBCA held its annual dinner this year at Cipriani Wall Street in Manhattan and enjoyed the largest attendance in its history, evidence of its expanded community outreach in the New York area. The event was organized by dinner co-chairs Cynthia B. Rubin and Maura E. Miller, assisted by an impressive planning committee and honorary dinner committee. Honorary President Judith S. Kaye, who was introduced by Hon. Loretta A. Preska (Chief Judge, S.D.N.Y. ), installed our 2015/2016 Co-Presidents for another year of service and she then installed the members of the Board of Directors and Advisory Board members. Co-President Kotler was appointed as Acting Justice of the Supreme Court, New York County in January 2015 and now presides over a City IAS part. Co-President Sharon Nelles is a member of the law firm Sullivan & Cromwell LLP. JALBCA’s Leadership Achievement Award was then presented by Hon. 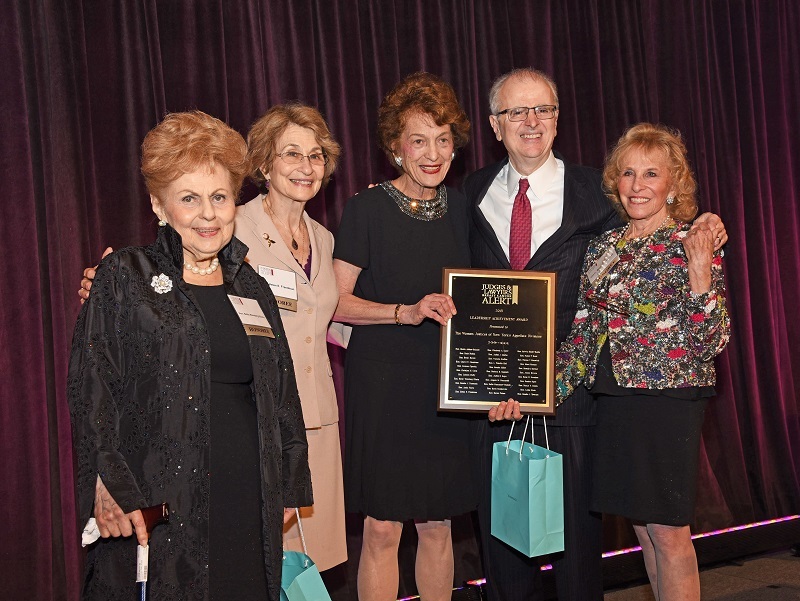 Jonathan Lippman to the 33 active and retired Women Justices of the New York State Supreme Court Appellate Divisions for their exceptional leadership. The award was accepted by Hon. Sondra Miller, Hon. Betty Weinberg Ellerin, Hon. Helen Freedman and Hon. Judith S. Kaye, all of whom are founding mothers of JALBCA. Judge Miller briefly explained the impetus for the formation of JALBCA and details from the moments of its inception. 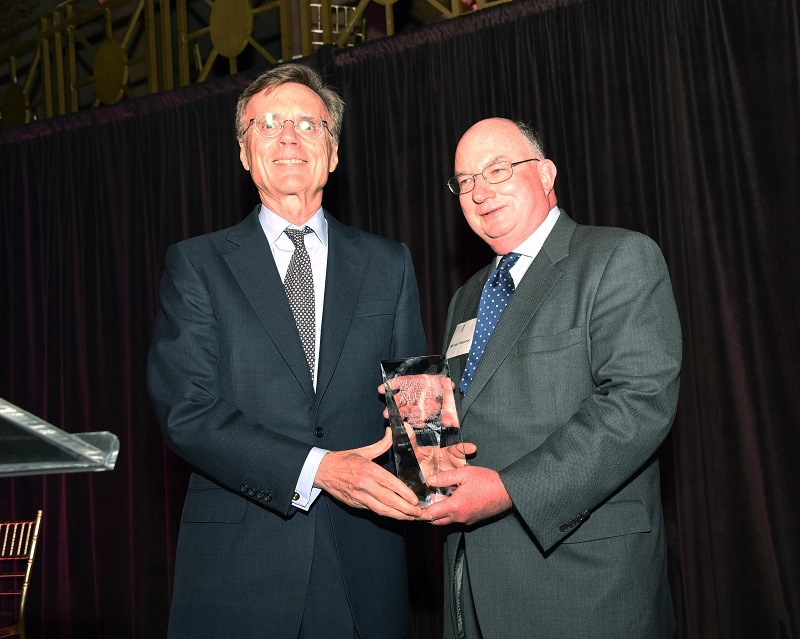 The JALBCA Maite Aquino Memorial Grant Award was then presented to Gregory K. Palm, Executive Vice President and General Counsel of The Goldman Sachs Group, Inc.
Past Co-President Judith Livingston introduced C. Hugh Hildesley, Executive Vice President of Sotheby’s, who presided over the process of obtaining generous sponsors for mobile mammography vans. This Courthouse Alert project, where JALBCA finances the uninsured or under-insured portion of the cost of hundreds of mammograms annually, performed via mobile mammography vans throughout New York City, is a signature project of the organization. In 2014-2015, JALBCA-sponsored scan vans screened over 900 women, approximately 160 of which were recommended for additional medical attention or diagnosed with breast cancer. Funds for at least 65 van days were raised in short order. To cap off the night, significant funds were raised through JALBCA’s silent auction, where many members and non-members alike donated a broad array of items. The dinner was a huge success and, as always, a wonderful evening. JALBCA awards multiple grants each year. Set forth below are status reports provided by three of such grantees (See prior JALBCA Newsletter for status reports from other grantees.). The Mount Sinai Breast Health Resource Program (BHRP) is dedicated to meeting the emotional and practical needs of women with breast cancer. It offers information, guidance and therapeutic support to patients by providing services that address the physical, psychological and financial needs that result from breast cancer. Through individual and group counseling, it helps patients navigate treatment options and cope with the challenges of a breast cancer diagnosis with the ultimate goal of promoting health, wellness and survivorship. Through generous donations and contributions, it has been able to provide group and educational programs for our breast cancer community for over 25 years. All services are provided free of charge. 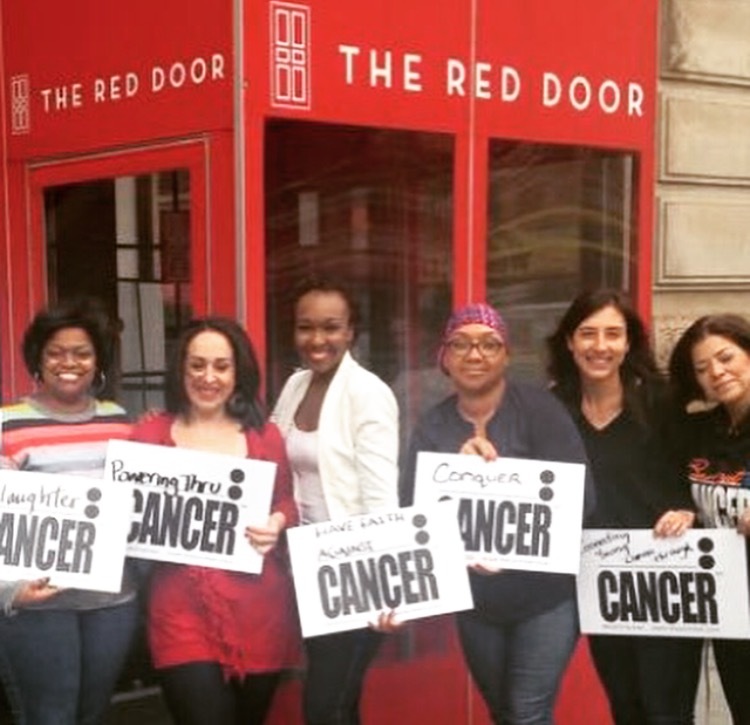 Because of the generous funding received through JALBCA in 2014, BHRP was able to create a unique initiative – “Young Women with Breast Cancer Program” – and start a support group called “Young Women Connect”. This group was formed based upon the feedback received from focus groups and an extensive needs assessment. This project was implemented to address BHRP’s findings, that the support needs of younger women were not adequately represented, nor were younger women receiving appropriate services from both BHRP’s program and within the community. As part of the Young Women with Breast Cancer Program, a dedicated social worker meets with women diagnosed under age 40 to offer therapeutic counseling and navigation services and to identify and meet some of the most urgent needs with which younger patients may contend. Young women with breast cancer have had interrupted priorities in their lives. Rather than focus upon family and career, they have had to focus on fear and uncertainty about their health and their futures. BHRP”s Young Women with Breast Cancer Program offers a supportive environment where young women who are grappling with their diagnosis and the sequelae of treatment can meet others like themselves. This program provides the necessary coping and knowledge tools that will enable them to reconnect to their personal goals. The Young Women Connect support group provides an environment where participants have the opportunity to develop strong peer relationships and thereby feel less socially isolated. Group activities help the participants to normalize their breast cancer experience while reaching for appropriate life benchmarks. The group’s focus is to help young women with breast cancer to move from patient role to survivorship activities. Many of the young women in this support group presented with financial concerns. Their breast cancer diagnosis represented an interruption or loss of wages, and for some, was a major stressor. Rent and food during their illness became a large issue. Public benefits were applied for when eligible but this could only address some of the financial shortfall. When members of this group presented with urgent needs, such as medications, uncovered surgical supplies, transportation for medical care, or food, money was provided through JALBCA funds. BHRP hopes to grow this successful program, to create partnerships with other organizations serving younger women with breast cancer and to expand these much needed services to more women in the metropolitan area. (1) Life Planning: CAP assists eligible cancer patients and survivors to plan ahead by preparing crucial documents that will be available if needed. The project works with a dedicated pool of attorneys who volunteer their services to assist eligible cancer patients and survivors with no-cost wills, health care proxies, living wills and powers of attorney. CAP has assisted many cancer patients to document their wishes in this way, including those who are homebound, in the hospital or in hospice care. (2) Health Law: The project offers assistance in challenging unjust health insurance decisions. Cancer treatment is very costly and most patients rely completely on coverage by their insurer. However, even after having tried to avoid additional expenses by staying in-network, they may find that a procedure recommended by their doctor has been denied, or that a service or test was, unbeknown to the patient, provided out-of-network. CAP assists cancer patients by preparing written appeals to dispute the stated reason for the denial. (3) Employment Discrimination: Cancer patients and survivors may face health-related discrimination in the workplace after their diagnosis. Taking medical leave, or requesting days off – either for ongoing treatment, or as a result of the treatment’s side effects – can make these employees vulnerable. As a cancer patient, the consequences of job loss can be particularly traumatic, affecting access to employment-related medical insurance, and reducing income at a time when their expenses are increasing. Through CAP, patients and survivors can speak with an employment attorney who will discuss their situation, assess their legal rights and protections, and advise them of any available options and remedies. In addition, CAP provides patients, survivors and caregivers with access to information and assistance through on-site presentations cancer-related organizations and support groups, and also offers training workshops to medical and social work staff and community organizations. Available topics focus on life-planning choices, workplace rights, health insurance problems, and medical debt. With the aid of JALBCA’s longstanding sponsorship, CAP is able to offer these crucial legal services, and to identify, and respond to, newly-emerging issues of particular importance to cancer patients and survivors. The City Bar Justice Center and, in particular, the staff of the CAP. 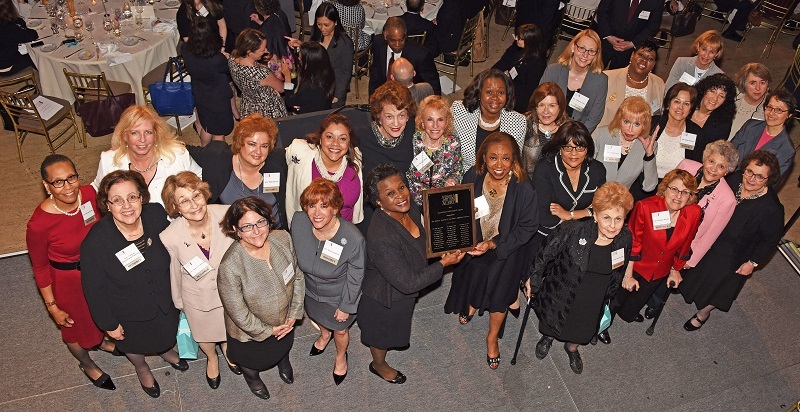 Since 2008, JALBCA has made grants to support The Family Center’s Judith S. Kaye Project, which provides expert legal and social services to over 45 low-income, minority, breast cancer-affected women and their families, annually. The Family Center services offered through this project include legal guidance and representation in the areas of Lifetime Planning (healthcare proxies, living wills, etc. ), Family Law (child custody, guardianship, etc. ), Income Maintenance (food stamps, SSI, SSD, etc.) and Housing (NYCHA Administrative Hearings, etc.). 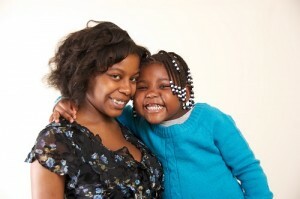 Social services available to Judith S. Kaye Project clients include individual, family and group counseling. Thanks to JALBCA funding, The Family Center sends staff into clients’ homes so that those mothers, who are ill and have compromised mobility, can still access all these services. 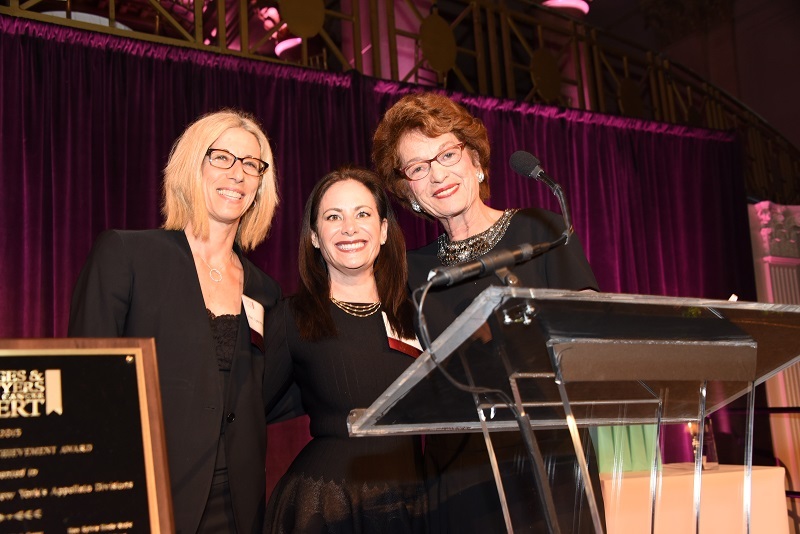 The Judith S. Kaye Project, which honors Judge Judith Kaye’s illustrious career protecting and defending children and families, has provided more than 330 breast cancer -affected low-income, minority women and their families with these services. 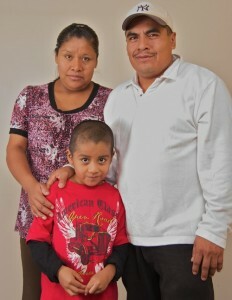 In 2012, JALBCA commenced its award to The Maite Aquino Program at The Family Center. This program specializes in providing legal and social services to breast cancer-affected women with very young children under age seven. This client population requires a unique focus on the needs of young families affected by breast cancer. Many of the mothers in this program are very young with very aggressive forms of breast cancer. 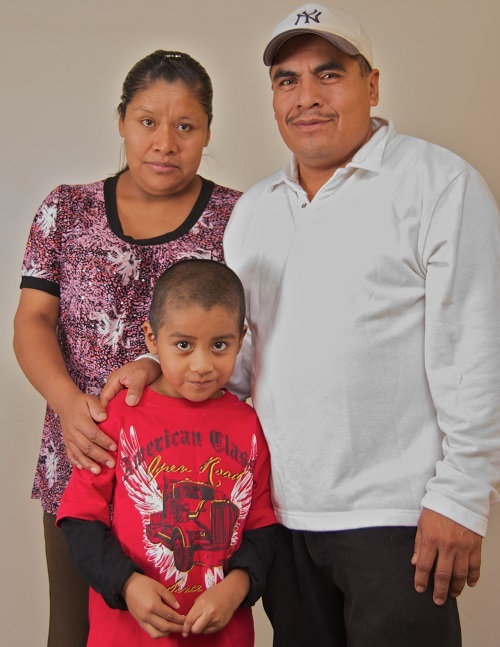 In memory of Maite Aquino, The Family Center provides these families with expert legal and social services, as well as early childhood development assessments and interventions as well. This ensures that children of breast cancer-affected mothers meet developmental milestones, despite the challenges that this illness brings to families. Since 2012, The Family Center has served over 110 low-income, minority breast cancer-affected women with young children under age seven to honor Maite Aquino’s legacy. The New York Times reported on April 21, 2015 that two large United States clinical laboratories, Quest Diagnostics and LabCorp, have joined with French researchers in an effort called “BRCA Share” to pool data relating to the mutations in the BRCA1 and BRCA2 genes. BRCA Share is based on a database of genetic variants maintained by Inserm, a French government health research institute. In order to join this effort, participants would be required to contribute their data to the database. There are apparently other industry efforts for data-sharing besides BRCA Share. It was also reported that a Silicon Valley start-up, Color Genomics, is offering a saliva genetic screening test for breast and ovarian cancer at a cost of only $249. The test would check for variants in 19 genes that are known to be correlated with a higher risk of breast or ovarian cancer, including mutations in the BRCA1 and BRCA2 genes. This compares with the cost of other commercially available tests which are reported to be in the $1500 to $4000 range. An unpaid adviser to the company is Mary-Claire King, the geneticist from the University of Washington whose research led to the discovery of the BRCA1 gene. The company claims that a physician will be involved in every order, which can be done via its website, and in the test results. An FDA spokeswoman is reported to have advised that if doctors place orders, testing companies that operate their own laboratories do not need FDA approval to offer their tests. CancerCare recognizes that appearance-related effects of cancer treatment can be difficult for many people. The organization schedules Wig Clinics which aim to empower women diagnosed with cancer to look and feel their best during treatment and thereafter and to cope with dignity and confidence. Description: This is an opportunity for women diagnosed with any type of cancer who are receiving chemotherapy to receive a free wig. New wigs are provided in a variety of lengths, colors and styles. During the individual 30-minute fitting, women have the opportunity to try on different wigs with assistance from a wig fitter. An oncology social worker is also present to provide support. Basic wig care is discussed, although CancerCare does not have the capacity to cut or style wigs. The Kanas Family Foundation Associate Professor of Surgical Oncology, Department of Surgery, Perlmutter Cancer Center. Moderator: Francisco Esteva, MD, PhD(Professor, Department of Medicine, Hematology and Medical Oncology, Perlmutter Cancer Center); and Michael Grossbard, MD (Professor, Department of Medicine, Hematology and Medical Oncology, Perlmutter Cancer Center).